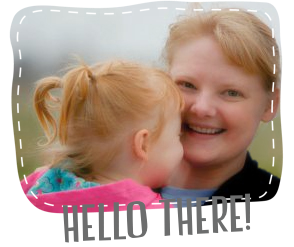 I'm entering the Hugs and Kisses Strip Quilt into the Blogger's Quilt Festival hosted by Amy's Creative Side. This quilt will be entered into the Large Quilt category. The quilt measures 70 inches square. I used 2-1/2 inch strips, and the blocks are trimmed to 12-1/2 inches. 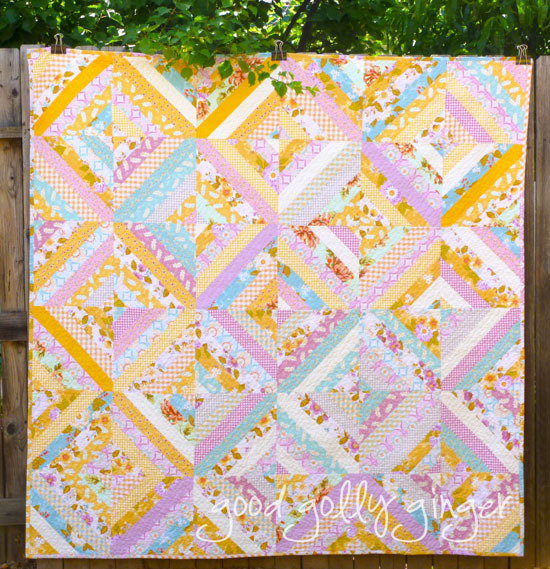 This was made from a fat quarter bundle of Promenade by Riley Blake and Kona Cottons in Petunia, Snow, and Daffodil. The texture of the quilt turned out lovely. I quilted hearts in rows spaced 2 inches apart. 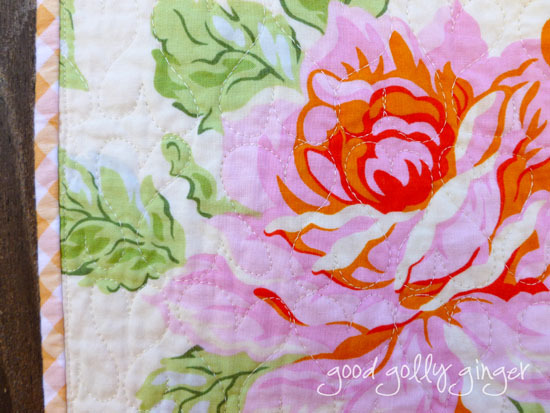 It was intense quilting, and I spent 3 days free motion quilting on the longarm machine. I loved every minute of it too! The backing is pieced from various Heather Bailey and Amy Butler fabrics. The tan fabric is from Andover Fabrics. I had just enough 2.5" strips to make the binding. I love the scrappy binding. It works so well with this quilt. Thank you for taking the time to look at my quilt! I love the backing and scrappy binding, too! 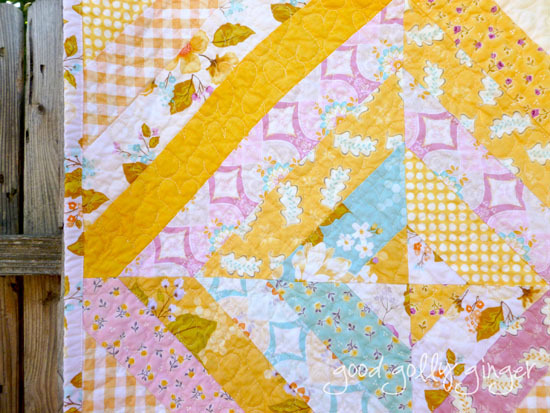 It is a very bright and cheery quilt, and the hearts are fun! Good luck in the festival! This is so pretty! I've always liked that line but the colours make me crave fruit salad and meringue pie. It's a beautiful quilt. Yummm! Thank you so much! This is one sweet quilt. Love the colour palette. And great quilting. 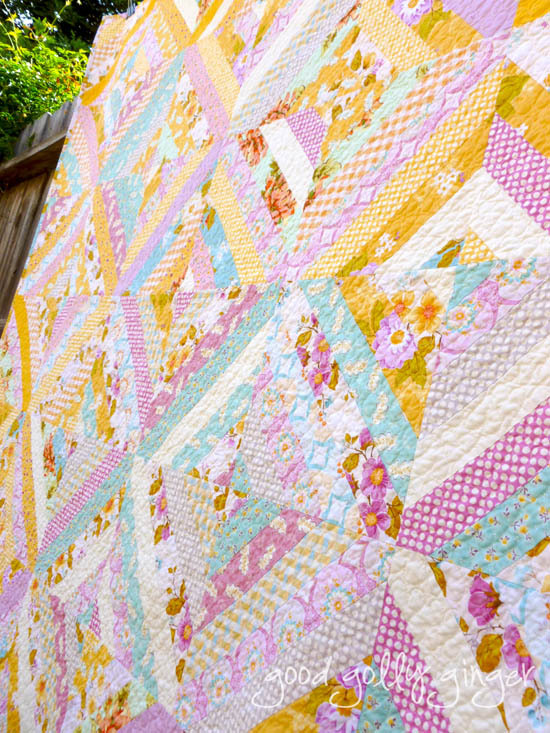 You have every reason to be very proud of this gorgeous quilt! Beautiful! 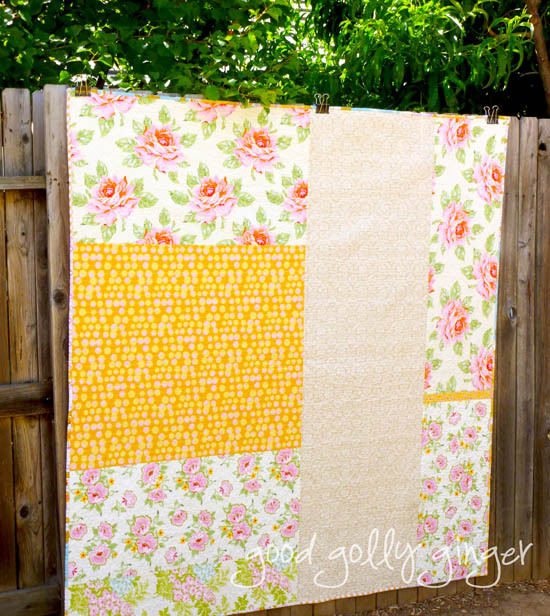 This quilt is on my ever-growing list of quilts to make! Will I ever ever get some on them done?